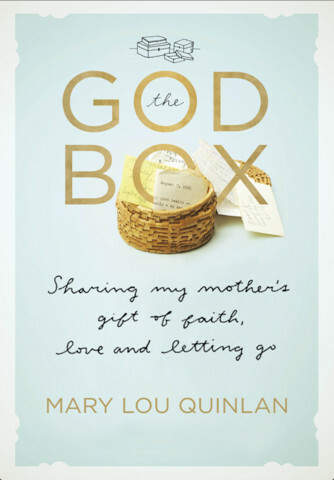 The God Box : Sharing My Mother's Gift of Faith, Love and Letting Go is not really a very easy book to review. I was asked if I'd like to receive a copy in exchange for my honest opinions and so you shall receive my honest thoughts, just as promised. However, I have to confess that sharing my thoughts on this book does make me cringe a bit. Why? Because in today's society, when someone is grieving a loss, we are taught more to accept their misguided intentions instead of pointing them out. After all, Quinlan has recently lost her mother, whom she loved. Surely I can see past any theological differences I have with her and just let her be? (I know this attitude exists as both sides of our family have had to deal with death and grief in recent history.) No matter the situations we ever find ourselves in, especially as Christians, we must be obedient to Christ in all things. Our emotions, no matter what they are, must always been submitted and checked against scripture - in all that we think and say and do. Grief aside, is what Quinlan suggests to her readers that they consider doing in line with scripture? It's a question we have to ask. The book is marketed as being "the story of a remarkable discovery [Quinlan] made after her mother's death." Quinlan finds two decades worth of notes which her mother wrote out as prayers for friends and family both and stuck into her "God Box." The God Box was a nondescript box which basically acted as a safe for her private concerns relating to those she loved. Quinlan explains throughout the book how very much she loved her mother. Truly, they had an amazing relationship with one another. Quinlan has great respect for her mother and they shared a friendship that can be quite rare between mothers and daughters: that of "best friends." By all of her accounts, they were. It is something of an unusual relationship but one they both thrived in. I don't mean for any of my objections to the book to be read as criticising that aspect of the tale. Quinlan's mother (also named Mary) was a remarkably caring individual who loved a great many people, but especially her family. It is clear that Quinlan suffered a tremendous loss the day her mother died and that makes you heart sick for her, no matter what your differences of opinion might be. Death is ugly. There is no other way to look at it. There is no question that we will be heard and there is no box necessary. You can think your prayers and/or pray them aloud and rest in confidence that your petition to God has not fallen on deaf ears. No tricks. No gimmicks. As Christians we know that we can approach the Lord at any time and for any reason. We are told to boldly come to Him, in confidence, believing in Who He says He is. We do not come to Him simply to "feel better" - although that is a general outcome of coming to Him. It is as C.S. Lewis once said: prayer doesn't change God, it changes us. When we approach the throne of grace, asking for wisdom, asking to be taught, we will learn. (And sometimes, even when we don't ask to learn, we do anyway.) For He promised that if we seek Him out, He will be found. (Jeremiah 29:13; Duet. 4:29; Proverbs 8:17) There is simply no question about it. A box with my thoughts on it is simply that: a box with my thoughts in it. Encouraging people to find comfort in an inanimate object - something of a "talisman" (which Quinlan referred to it as at one point in the book) - is to lead people astray. No matter how happy the idea of the box makes us, it cannot help us or save us. Only God can - and you can go directly to Him and present those requests to Him. Quinlan concludes the book by offering suggestions on how you might go about creating a God Box of your own. She mentions that several of her friends, who know the story of her mother's box, write their prayers addressed to "Dear Mary" instead of to God. "Whatever works for you" is the general theme and attitude of this book. It is merely an "inspirational" tool to help you find peace in your chaotic life. The sad thing is that the suggestion, while it may inspire you to something, doesn't inspire you to the right thing - a confession of sins and an appeal to the Lord to direct and guide, granting the only true peace that is to be found. The God Box is, ultimately, misguided. The Box cannot save you. Christ can. This book was provided to me by The DeMoss Group in exchange for my honest thoughts. @Annette - Yes, I was going to add a disclaimer for Prayer Journals but my review was getting a bit too long so I went a different route. Many Christians do keep prayer journals and I do not believe that there is anything wrong with doing so and many good reasons TO do so. Certainly prayers can be written down - and repeated. The way that The God Box is presented though is, "Look. Here. Comfort for your anxious thoughts." And I'm saying (and I know you agree, "Look. Here. God Box not necessary. He will hear you the moment you voice your request and you can rest safely assured that you have been heard." As for what the author's mother believed -- I would have to say that she had faith that God did hear her prayers. However, she also prayed to Saints and stuffed those prayers in the box as well. (The next part is not addressed to you, but just continues my thoughts in general.) As a Christian, I believe that we have been granted access to the throne of grace and therefore we do not need to attempt to address prayers anywhere but to God. Furthermore, we are not allowed to do so but are to 'call upon the name of the Lord' to be saved, to be heard, to be rescued. No other one can do it. That to say, I'm a little slow in being excited about the message of book because it points in so many WRONG directions and confuses the path that leads to the RIGHT direction. I can understand how this would be difficult to critique/review. I can appreciate the sentimental value of such a box as belonging to a dearly beloved and missed mother, especially as it would have some of her deepest thoughts and concerns. But to elevate it to something of a talisman is going too far. It would almost be as if putting a prayer request in a prayer journal would make it more "acceptable" somehow rather than just as a record for one's encouragemnt of requests to God and His faithfulness in answering. I agree about being able to come to God at any time without a box, and that we're to pray to Him and not saints or Mary. Excellent clarification, though I was likely the only one who needed it. It is very disturbing, to me, about others praying to Mary's mother. Though I think it may be perfectly acceptable in the Catholic church. Yes, I started off thinking this was somewhere where the lady kept scripture verses that meant something and wrote her prayers, but I see it was going a totally different direction. I do think it is important to keep where people are emotionally in mind while you talk to them, but that doesn't mean you let your clear thinking fly out the window. You can speak truth in a tactful manner.